El Questro Homestead and the luxury adventure-cruise ship True North (both members of Luxury Lodges of Australia) have partnered to offer the ultimate Kimberley experience. The El Questro Homestead/True North partnership will allow guests to experience the Kimberley in unrequited luxury from the magnificent Kimberley coast to the oasis that is El Questro Homestead located at the heart of the 1 million acre El Questro Wilderness Park. El Questro Homestead is located on a 1 million acre working cattle station and is one of Australia's most spectacular destinations in far north Western Australia. Just 110km from Kununurra, El Questro is a remote and rugged destination that promises the seclusion to explore this iconic part of Australia with its landscaped forged over 350 million years ago as a result of volcanic eruptions – the result of which is the stunning Emma Gorge, Chamberlain Gorge and Cockburn Ranges. With four major rivers systems across the property, guests will see native animals, birds and fish in the rivers, fresh water springs and salt water estuaries. A wide variety of exclusive experiences are on offer every day of the season which runs until the end of October each year. These allow guests to take in the vastness of the area by 4WD, helicopter, horse and on foot – all led by expert guides. In addition to new scenic flights available for this season, full-day fishing tours for the elusive local barramundi are also available. Homestead guests also enjoy exclusive access to the thermal springs of Zebedee Springs each afternoon. Dining is a delicious event with menus inspired by local and Western Australian produce and guests can select to join other guests at a communal table or enjoy the privacy of dining for two on the ridge overlooking the Chamberlain Gorge – a truly unique El Questro experience. True North offers an exciting journey along the Kimberley coastline - one of the world's last great wilderness frontiers. Guests have ample opportunity to explore otherwise impossible to access beaches and rivers. There are majestic waterfalls, awe inspiring gorges, abundant wildlife and encounters with ancient cultural history – a Kimberley experience like no other! Starting in the pearling port of Broome - a seven-day Kimberly cruise aboard the True North includes the iconic Horizontal Waterfalls, the chance to 'land a barra' at Leadline Creek and maybe again in the Sale River, the opportunity to witness the tide falling from Montgomery Reef, the option to visit the Mitchell Falls via scenic heli-flight and, the privilege of seeing The Bradshaws – the oldest art known to man! 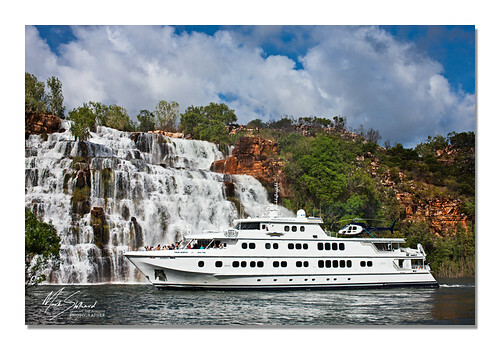 “Combining the spectacular coastline of the Kimberley on a True North cruise with a stay at El Questro Homestead, in the heart of this raw and rugged landscape, is a fantastic way to experience this stunning part of Australia,” said Lori Litwack, General Manager, El Questro Wilderness Park. Prices for a seven-night True North Kimberley cruise start from $11,095 per person while three nights at El Questro Homestead starts from $3,464 per person. The True North price includes all normal cruise activities and dining excepting alcoholic beverages and scenic heli-flights. The El Questro price includes accommodation, gourmet meals, all beverages including Champagne and Australian wines and selected touring.